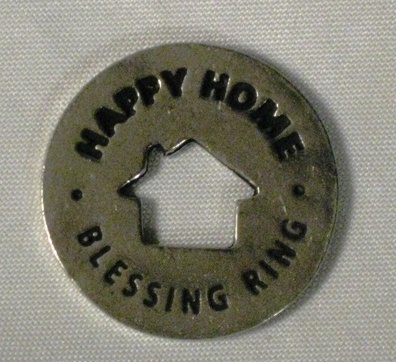 Happy Home Blessing Ring has a house cut out in center. Front: "Happy Home" Back: "Home is where the heart is"
Blessing Rings® are versatile charms that touch the heart. For your pocket, keychain or necklace. The size of a quarter, Blessing Rings® express individual poignant messages about all of life's biggest, unexpected and everyday moments. The Blessing Rings® back is engraved with different inspirational and thought provoking terms of endearment. 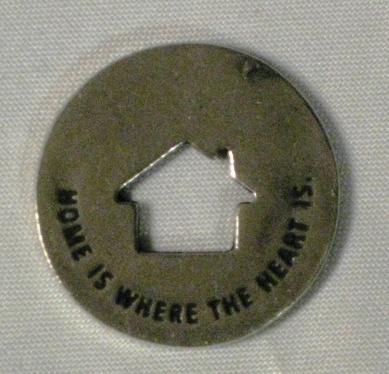 Individually hand crafted in pewter, the center is outlined with a symbol for a specific subject.